The Unipod is one of the most sensible upgrades for your hard-working RiscPC or A7000. It adds USB and speeds up disc/network access in one easy and cost effective upgrade. The Unipod is a standard Acorn style expansion podule, so it will also fit into an A5000, A540, and the A310 and A410 range. Webmonster has not tried a Unipod in one of these machines, so we can't say how well it works. A podule backplane is required to run any podules. 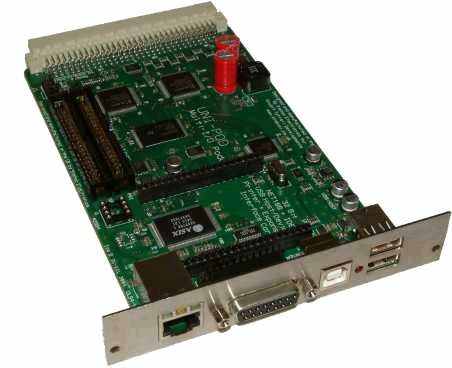 Webmonster has backplanes in stock for RiscPCs, but we can obtain backplanes for other machines. A7000/A7000+ can have either a backplane or a CDROM drive fitted. External CDROMs can be run via USB, of course.